A 3-year-old Phoenix girl is recovering in a hospital after her grandfather was found allegedly choking her during an exorcism. The girl is expected to recover physically and police are investigating "other possible abuses," said Sgt. Joel Tranter, a Phoenix police spokesman. Tranter declined to specify the nature of the possible abuse. The man died after what Phoenix police described Sunday as a struggle in a house where officers went in response to a report of an exorcism being conducted on a young child. Officers arrived at the house on Saturday in response to a check-welfare call from a relative of the family that lived there and entered when they heard screaming from a bedroom, Tranter said. A bed was pushed up against the bedroom door but officers were able to push it open a few inches, allowing one to peer inside and see that 49-year-old Ronald Marquez was clutching his bloodied granddaughter, who was crying in pain, screaming and gasping as Marquez choked her, Tranter said. A bloody, naked 19-year-old woman who was determined to be Marquez's daughter and the girl's mother also was in the room, chanting "something that was religious in nature," the spokesman said. 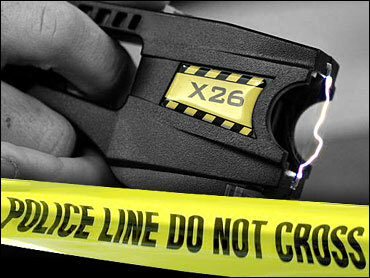 The officers then were able to force open the door enough for one to enter, leading to a struggle in which the officer used a Taser stun gun as he tried to free the girl, Tranter said. After the initial stun had no visible effect on Marquez, a second officer also squeezed into the room and Marquez was stunned a second time, allowing one of the officers to free the girl and pass her out the door to the relative, Tranter said. Marquez was placed in handcuffs after a struggle with police and he initially appeared normal but then was observed not breathing, Tranter said. Efforts by the officers and Fire Department personnel to revive him failed, and he was pronounced dead at a hospital. Cause of death was not immediately known and autopsy results probably will not be available for several weeks, Tranter said. With one arm, Marquez held his granddaughter in a headlock, while squeezing her torso with his other arm, police told the Arizona Republic. "It's very bizarre, (a) very unusual and pretty horrific situation this young child was involved in," Tranter told the newspaper. Tranter said the investigation was continuing but that the relative who called police said there also had been an exorcism attempted Thursday. "The purpose was to release demons from this very young child," Tranter told The Associated Press. The spokesman said the 3-year-old girl and her mother were hospitalized for treatment of various injuries. He declined to identify either by name but said they lived in the house with Marquez. Tranter said the girl had bruises and other undisclosed injuries, while the woman had a cut lip and facial lacerations. The mother was not immediately arrested, Tranter said. "We will be looking at criminal charges at her."